Two distinct economies exist side-by-side in Papua New Guinea - the traditional and the cash economies. The traditional sector, mainly subsistence and semi-subsistence farming, supports about 85 per cent of the population. Most villages are self-sufficient and small surpluses of produce are available for trading. The economy is dominated by mineral and petroleum projects. However, the agriculture, forestry, fishing and manufacturing sectors combined still account for a significant portion of the nation's gross domestic product. Major imports consist of machinery and equipment, manufactured goods, processed food and chemicals. The late 1980s saw the Papua New Guinea economy experience a difficult period. 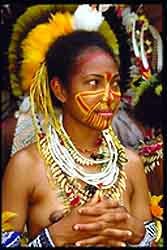 The closure of the world's largest copper mine, on Bougainville Island, was a significant set-back. That was compounded by reduced world prices for a variety of agricultural commodities central to the economy. The Government took corrective measures by reducing expenditure, devaluing the kina (the local currency), restricting wage increases and imposing restrained monetary policies. There are extensive reserves of natural gas and oil. 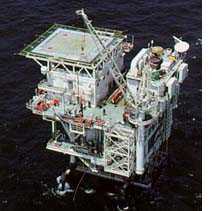 The first oil production began at the Kutubu field, in the Southern Highlands, in mid-1992. A conservative estimate of recoverable reserves at this field has been put at around 270 million barrels. The Gobe Oil Project, currently under construction in the Gulf and Southern Highlands Provinces, is scheduled to commence commercial oil production in late 1997/early 1998 at a rate of 50,000 barrels of oil per day. Other known fields are yet to be developed. The main mineral deposits are copper and gold but there are also recoverable deposits of other minerals. The Ok Tedi mine, in the Western Province, is now a major producer of copper and gold. The Porgera gold mine in the Enga Province is one of the largest in the world and is expected to produce 11.3 million ounces of gold over its 20 year life. The Lihir project in New Ireland Province is estimated to have 13 million ounces of gold which will be mined over a 30 year period. The Misima gold mine in the Milne Bay Province commenced operations in 1989 and is producing an average of over 300,000 ounces of gold per year. The waters around Papua New Guinea contain large stocks of marine resources. Within the 200 mile economic zone are large varieties of fish, including migrating schools of tuna. Forest products are one of Papua New Guinea's major exports. There are 36 million hectares of enclosed forest of which about 15 million hectares of high quality tropical hardwoods are considered to be suitable for development. The Government is mindful of its obligations to environmental heritage when promoting the forest resource. Each major investment project is carefully evaluated in terms of its environmental impact and every effort is made to develop appropriate guidelines to meet the needs of both the local people and the investors.